Awards | Company | System development company in Tachikawa, Tokyo. 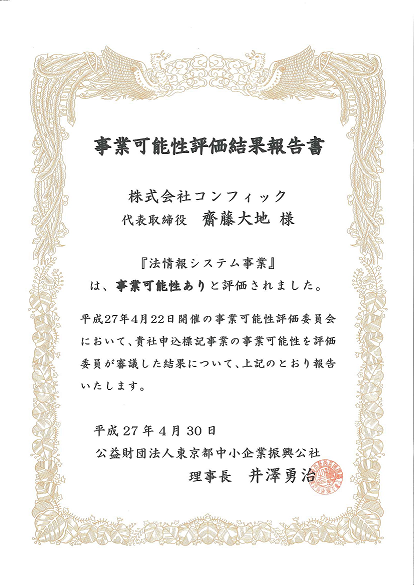 CONPHIC Co., Ltd.
“Legal Information Business” of CONPHIC Co., Ltd. was evaluated as “business with possibilities” about its growth and future prospects in Business Probabilistics Assessment conducted by Tokyo Metropolitan Small and Medium Enterprise Support Center, and we will receive business support until March, 2019. CONPHIC Co., Ltd. will research and develop better legal information systems and contribute to the society.